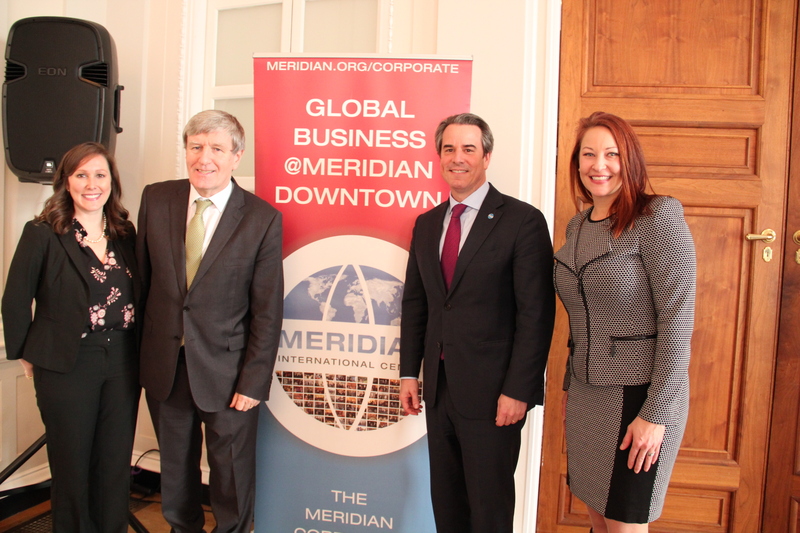 On January 24, 2018, Meridian partnered with First Data Corporation to host a breakfast with His Excellency Ambassador Daniel Mulhall, Ambassador of Ireland to the United States, as a part of the Global Business Breakfast series, which serves as a platform for companies to have off-the-record discussions about key global issues affecting their specific industries. Ambassador Mulhall kicked off the event by providing remarks about the history of Ireland’s economy and the importance of increasing globalization both in Ireland and around the world. Ireland has the fastest growing economy of the Eurozone countries and has become progressively attractive to United States companies for investment and expansion opportunities. These remarks set the stage for dialogue among the companies in attendance, such as The Coca Cola Company, S&P Global, and Gallup, about the political and economic uncertainties that have been brought by the United Kingdom’s decision to leave the European Union. Because Ireland is particularly dependent on the British economy for economic success and transits its products through the United Kingdom to other European countries, Ireland finds itself in a difficult position following Brexit. However, the future of US-Irish relations shines bright. Ireland hopes to be part of the flow of ideas and innovations that the United States has planned, especially in the technology industry. Ambassador Mulhall stated that he looks forward to when Ireland can intensify their relationship with the United States and can become an equal partner to the United States. Meridian’s CEO Ambassador Stuart Holliday and Ambassador Mulhall also discussed the state of immigration policy in Ireland. Because Ireland sees itself as a nation of immigrants, there is no apparent anti-immigrant sentiment in the country: as much as 70% of Ireland’s workforce comes from Eastern European immigrants. Ireland’s diverse workforce and industries, as well as the country’s low corporate tax rate, make it an attractive choice for corporate expansion to both the United States and other countries. Meridian looks forward to working with the Embassy of Ireland on future initiatives in Washington.